Bala Sai Baba is truly a transparent Sathya Sai Baba copycat to a hilarious extent down to almost every smallest detail. How anyone can not see through this as a scam to make money is quite surprising. Bala Sai Baba’s henchmen were transporting large amounts of banknote by auto-rickshaw (tempo) when the police discovered it. The passenger fled and was not caught. The police at Andhra Pradesh police headquarters in Lakdi-ka-pul area nearby seized the money and investigations continue. 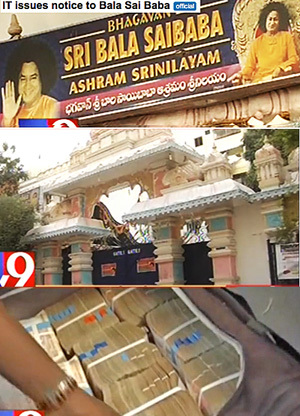 The Bala Sai Baba Trust, a city-based charitable organization, was slapped with a notice by the state’s Income-Tax Department, asking them to furnish details of cash worth Rs 6.75 crore. (i.e. Rs. 6, 750,000) See Times of India article and tax notice details.